I always find my work as a photographer to be thoroughly interesting, exhilarating and continually varied. Assignments, collaborations and personal fine art projects, always inspire me to want to achieve more and more. As a result, this leads me to continually document my (interesting) occupation within my various social media channels like Instagram and Twitter. My regular content tends to mainly focus on images taken on the spot and then subsequently shared, but rarely do I actually give a detailed insight into what actually goes on behind the scenes. In this blog I will highlight the many different components that went into an inspiring day. When I was being approached to work together with Adobe, by Team Lewis, I was full of excitement as they requested to collaborate with me on an inspiring and creative photography project, that would not only document a day in the life of myself as a photographer, but also would allow me to hopefully inspire other photographers, through my story in tutorials in where I use of their extensive range of powerful editing tools. Which as any photographer already knows, are at the cutting edge of software. I was excited and of course jumped at the chance to work with them again, like I did before in a series of blog tutorials. And so began an inspiring day. Prior to the day in question, both myself and Adobe opened up a professional dialogue about what was expected from me and what they wanted out of the collaborative project. With that said, I was delighted to hear they had great faith in my work and valued my contribution to be worthy of such extensive exposure. Of course, I was naturally ecstatic as I have continually used Adobes diverse range of products within my photography and graphic design work, for many years. This opportunity certainly felt like my calling and of course this was a unique opportunity that I simply wasnâ€™t going to miss out on. In fact, it actually provided me with a wonderful opportunity to showcase my ideas. Develop and fine tune key skills and also clearly demonstrate my vision as a photographer, within the wider audience and above all else, it allowed me to convey my passion for photography with other like-minded individuals. Concept creation is one thing, fine tuning it, to make it your best is another. The build up to the actual day turned out to be pretty straightforward. As I continually worked through a million ideas, written down on paper and regularly stored in my head. Throughout the process, I wanted to clearly communicate my trademark â€˜Silenceâ€™ theme within all of my imagery and within the day itself. Afterall, I do feel Iâ€™m mostly remembered (as a photographer) for my calm and silent style, therefore it was of paramount importance to steer this aspect clearly to the forefront. As I live in the heart of the city of Rotterdam, It might have already seemed like I was presented with a pretty significant challenge. Especially, when I was asked by Adobe to document and depict the theme â€˜Silenceâ€™ within the context of an urban environment. Needless to say, Iâ€™m continually in search of new places to capture and the significant moments of Silence. I revel in the challenge and in the end, it felt more natural, as everything simply fell into place. To maintain clarity and swiftly move things forward in a clear and concise way, I articulated ideas to Adobe and together with their suggestions, we had a fabulous and inspiring day planned. Our day started very early, with an early alarm call. I knew it would be a pretty intense day, rushing from one location to the next. Maintaining composure was the order of the day, but I was extremely satisfied knowing that the plan of the days events were well planned and it would all work out in the end. Allowing everything I wanted to be achieved, would be achieved. The day comprised of different elements, that would come together to tell a story. I would be filmed in three locations around my home city of Rotterdam where the story of Silence would be told. I carefully chose the locations, as I not only knew them well, but I wanted areas that contrasted with the busy envirement of Rotterdam. Our first photoshoot would be in the vibrant city of Rotterdam and the main focal points like the skyline along the river Maas at the foot of the Erasmusbridge. We took of from Leuvehaven, from where we took the famous Rotterdam watertaxi. Making the most of the perfect morning light and shooting across the Maas towards the skyline beyond. Great light above the river Maas really enabled me to capture some really great morning shots. Checking the camera settings and viewing the shots. After setting up the shot, I sorted and edited the images through the use of Adobe Lightroom CC. Below you can see the final edited image from this perfect morning. I particular liked how the editing tools enabled me to really enhance the suns natural light. Click here to see the full tutorial on how I edited this picture using Adobe Lightroom CC. For the second shoot, I chose the beach of Hook of Holland, a place where I grew up. It always offers a location I always feel at home with. A place I can retreat to and escape from reality, from time to time to find Silence. I love the dunes and the light contrasts that can be displayed here. In the meantime talented photographer Jurriaan Huting was capturing my portrait. Attempting to find different subjects for the perfect picture. Time for a break and a moment to review and reflect upon the best bits of filming. Check out the full tutorial on how I edited underneath image in Lightroom here. Here is the final edited image from my second shot of the day, before and after. I really like the leading lines that lead to the person in the distance. Finally, I chose an area in the city that is always dedicated to peace and serenity. An area of Rotterdam where the locals can frequent in the hope of periodically replenishing and recharging their batteries. 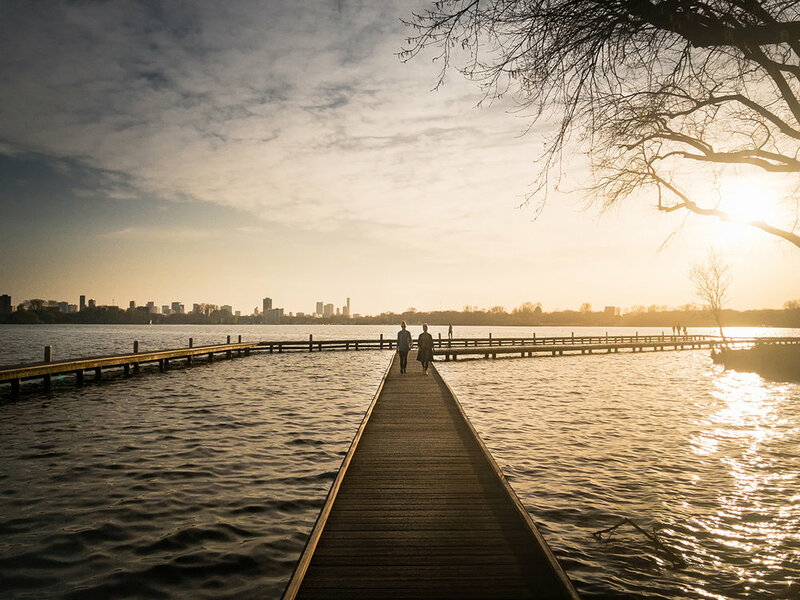 The jetty walk provided the perfect location and vantage point for shooting. Especially with the fantastic sunset! Setting the camera and shooting long exposure. Using the tripod to steady the shot. Unlike the first two images, I have took this one with my iPhone and edited it on the spot. Click here see the tutorial in how I did that! As highlighted in the top part of this post, this particular day was fantastic and I cannot thank Adobe enough for choosing to film me and produce a concept around me. It was an incredibly busy day. Demanding a lot out of me as a person and as a photographer. It also demanded a lot out of the crew, who helped put all of this together, in a very slick and professional manner. They were patient with me throughout and continually displayed an abundance of talent. Eventually, producing the fantastic video footage to accompany this superb assignment. MG-Productions (who produced the video content) are based in Eindhoven, The Netherlands. They are a great group of guys producing and delivering inspiring content. In addition, the very talented Jurriaan Huting. Who is a photographer based in Nijmegen, compiled many of the still shots from the day. Which included many of my portrait images. I personally think he is a fantastic photographer, who has a positive future ahead of himself. His work is superb and the images taken from this day, were just as I would have wanted them to be. Creative and inspiring! Finally, I would to extend a big thank you to the very talented team at Team Lewis, who made this campaign possible. They have a significant and highly regarded list of clients such as Adobe and a huge amount experience, when working with big clients. Thank you for your trust and choosing me to work with. I really appreciate it. For me personally, it has been amazing to again work with Adobe again and I have loved every minute of it. It was a great experience, a learning curve and one that I will not forget in a hurry.